Big BIG FINISH Week: Doctor Who - PHANTASMAGORIA Review | Warped Factor - Words in the Key of Geek. The first story after a regeneration is usually a bit of a let down. You’ve had time to get over the excitement of the new, and the discovery of what the new Doctor’s personality is like and now you see what they’re like when they’re not post-regenerative, just getting on with the business of day-to-day universe saving. 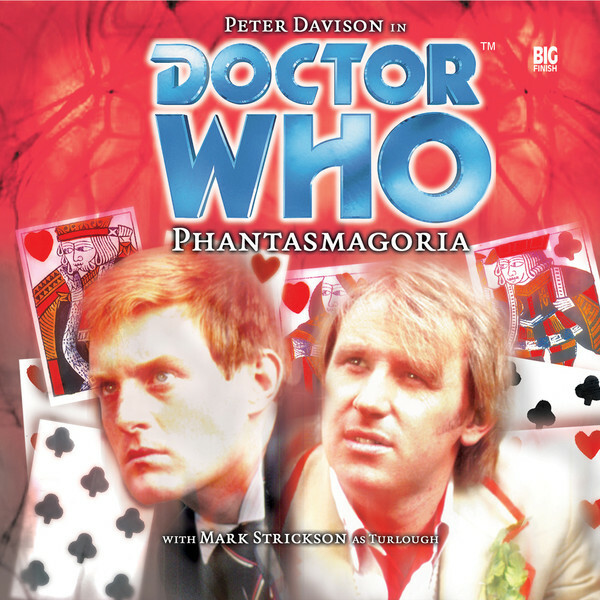 There’s a little of that feeling about Phantasmagoria, even though it’s in no sense the first post-regenerative adventure for Peter Davison’s Fifth Doctor. What it is though is only the second Big Finish story ever released, and the first time a Doctor flew solo without his other selves cluttering up the timeline. The Sirens of Time had been a pretty special start to the Big Finish story, but now the Fifth Doctor and Turlough, travelling without Nyssa, Tegan or Peri (so – in the gap between Resurrection of the Daleks and Planet of Fire then), get to see what they can do with an audio universe at their fingertips. Can we say ‘a little rusty’ without seeming overly unkind? Davison has a handle on his Doctor, but in all fairness he hadn’t played the role as the solo lead for thirty years when the script for Mark Gatiss’ Phantasmagoria came his way, so there’s a danger, if you’re familiar with his more recent stories, or indeed with the TV version, of Phantasmagoria disappointing with its hero, as Davison, while never bumping into the virtual furniture (he’s far too much of a professional for that) sounds a little off in his delivery of the Fifth Doctor as he stretches back into the role. Mark Strickson too had had a whole other life since he was Turlough, the obnoxious alien dressed like a schoolboy, up for a character reformation with the Doctor. In Strickson’s case though, the difference between TV Turlough and Phantasmagoria Turlough is more one of the necessities of the writing process – never having been a sole companion for a whole story on TV, Turlough avoided most of the ‘What’s that, Doctor?’ burden that was thrust on most other companions. In Phantasmagoria though, he has to carry the whole weight of ‘things we don’t understand,’ and as such sounds more like an optimistic omni-companion than the saturnine, sulky alien he really was (for contrast, take a listen to the more recent The Memory Bank And Other Stories’ for how the writing, and Strickson’s performance have evolved to allow him to both be a sole companion, and still retain that sense of essential prickly Turloughness. Storywise though, Phantasmagoria is indicative of the breathtaking punch of new imagination that had gone through the Virgin New Adventures and other fan productions, and found itself at Big Finish, looking for opportunities to tell new Doctor Who stories for Classic Doctors. Set in England in 1702, just as Queen Anne takes the throne, the Doctor and Turlough find themselves in a land of low taverns, highwaymen, buxom serving wenches and dark deeds in dim corners. While The Visitation may be strong in this one though, it takes the opportunities afforded by a non-TV medium to deliver a villain with practically everything – sinister cute name, snarling dark hints, fantastic calling card and, as emerges once the Doctor starts probing, far more going on besides, with an alien ship of body horrific construction. Oh and evil plans of course. Got to have an evil plan or it’s not really Eighties Who (let us never speak of Black Orchid again). find the reign of Queen Anne to be perfect cover for their operations, leaving the Doctor and Turlough almost as twin kingmakers, throwing their weight behind one alien or another to determine how the story ends. Phantasmagoria is by no means a perfect Doctor Who story in any medium, but what it most certainly does is announce that Big Finish is here to stay, to deliver the kind of storylines that had made the Virgin New Adventures such a success and kept the idea of Doctor Who alive through a period when the TV landscape was unfriendly to what it had been. These were new stories, complex stories, more adult and realistic stories, for all they come attached to Gatiss’ predilection for names from romantic, not to say Mills & Boon fiction – there’s a dashing highwayman here named Major Billy Lovemore, and a dark-voiced gambler named Sir Nikolas Valentine. It also proved the early power of Big Finish’s little black contact book of Equity’s finest – Along with Davison, Strickson and Briggs (never shy of filling in with an individualistic voice), Phantasmagoria also featured writer Gatiss as the admittedly fabulously-named Jasper Jeake, Nineties comic-whippersnapper David Walliams as Quincy Flowers, and one of Britain’s greatest jobbing comic and dramatic actors, David Ryall as Sir Nikolas. Keep an ear out too for TV stalwart and eventual darling of Simon Pegg movies, Julia Deakin as Hannah Fry – it’s a role she makes her own, and a role that grows more significant as the script unfolds. Phantasmagoria is a rock and roll pre-gothic horror story in a gloriously grubby setting, and it’ll push you on from start to finish. Listened to almost two decades later, the initial struggle of Davison and Strickson to get back into parts that were a good decade and a half behind them is evident, but as a calling card to bring an audience together, to get a fan base starting to coalesce, it does all the right things. Sirens of Time might be the first Big Finish story. Phantasmagoria is the difficult second album that’s made to sound easy, and that establishes Big Finish as a company here to stay, here to deliver the kind of Doctor Who fans love, and here to take the audio world by storm.